Controls Panel Control - Allen Bradley PLC and touch screen operator interface controls (menu driven). Includes 250-die memory for recall of feed length, sheet rows, etc., (accessed thru a touch screen). Receding Head – Rack and pinion drive with acceleration/deceleration ramping for smooth starting and stopping. A cross-center push bar is included in the head of the press. 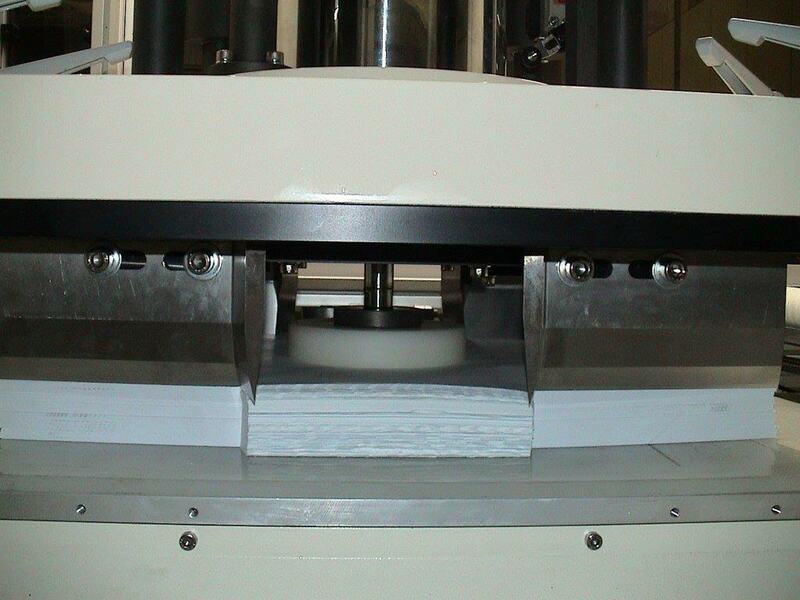 ﻿Cutting Surface -﻿ Oscillating pad unit, mounted on bed of press for increased cutting pad life. Includes power driven device to move the cutting pad as required. Scrap Removal Conveyor - Front scrap conveyor to remove scrap manually pushed to the front of the press. 8” Wide x 6” Deep. Includes bonded “Vee” type belt. This will be bonded to the flat belt for improved guiding of material scrap. Side shields are provided to prevent scrap from getting directly between the belt and the conveyor sidepieces. 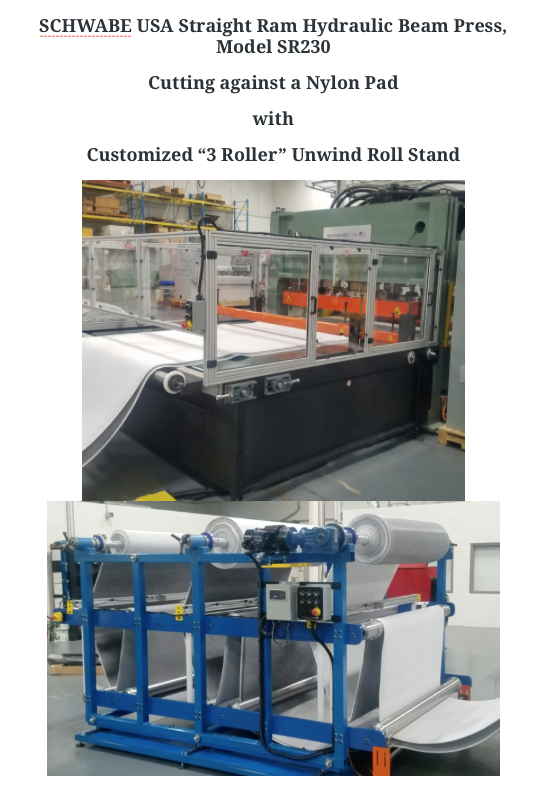 Rear Removal Tray – The press includes a rear removal tray, which enables the operator to push the scrap off the back of the press and slide into a large collection bin. This tray is for use with a collection bin which is 31.5”high x 40”wide x 40”deep. The gap between the cutting surface and the top of the collection bin is approximately 3”. Enough clearance will be provided between the flywheel housing and the inside of the rear guard support legs for wheeled collection bin to roll in from the side of the machine. Laser Light Projector – 2-laser projector for material loading position, which includes an on/off switch. Oil Pan System to lubricate dies – Pneumatically operated pan on rear of press replaces existing oil roller system. Cutting Stroke - 7.1”, adjustable. Includes four (4) post- manually adjustable synchronized mechanical stop rods for restriction of bottom of stroke for increased die and cutting pad life. Complete with ratchet and dial indication for adjustment. Die Mounting - Magnetic fixture provided in head of press with keyway (and fixed keys) for precise die positioning. Magnetic fixture also enables dies without backing plates to be used. Also includes a foot pedal for energizing the magnet for the die clamping. "Remember that if you ever need a positive testimonial on the EA25, you can count on me. I think it’s a great machine. Side by side, it blows the PHP away". Automatic power operated sliding table with pneumatically actuated “lift” holding clamps, mounted on rear of sliding table, set up to operate automatically in conjunction with cutting cycle. The clamps are individually controlled and can be programmed to retract in order to achieve full material utilization. Air flotation in lower clamps allows minor adjustment of the paper stack. ﻿Cut Part Ejector Ram for EA envelope press. Die Lubricating roller for the Freeman Schwabe Model EA Envelope cutting press machine. Cut Part Ejector Ram for EA envelope press. Includes the movable dry run controller, which is used to edit a program for a printed sheet – BIG time saver! Material side guides with retractable pneumatic pusher in order to square up “lifts”. Pneumatic cut sheet pusher automatically power shifts “lift” with envelopes and waste to side table for easy cut parts picking. Die lubricating roller moves across edge of die for improved cut quality and prolonged die life. Die lubricating pad for improved cut quality and prolonged die life. Pneumatic knock-out unit assists in separating cut envelopes from waste. Head mounted pressure plate insures consistent cutting through entire lift of paper and also assist in ejecting envelopes from cutting die. Includes a switch on the main control panel to turn the ejector ‘on’ & ‘off’. Pressure roller insures flatness of “lift”(programmable). Air cylinders are ISO standard for easy maintenance. Cutting Surface - Polypropylene cutting pad with automatic pad shifter located on the sliding table for added die and pad life. Guarding – Front Type 4 light safety curtain and rear safety guarding. Also includes head safety blocks for working under the head of the press. Frequency converter cushion system for soft stopping ability. Die lubricating roller for improved cut quality and prolonged die life.